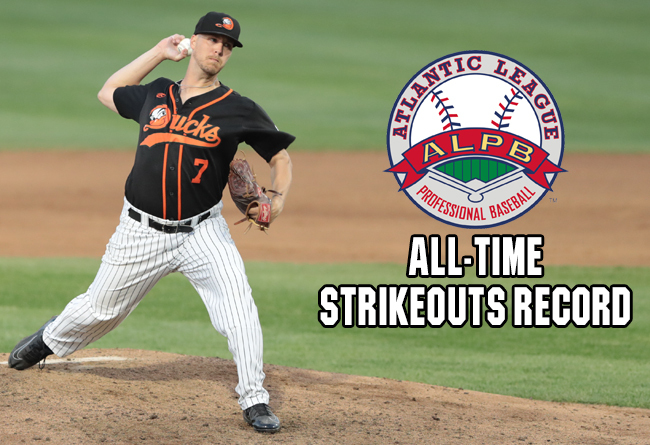 (Central Islip, N.Y., Aug. 4, 2018) – Long Island Ducks right-handed pitcher John Brownell became the Atlantic League’s all-time leader in strikeouts on Saturday night during the Ducks 10-0 win over the Road Warriors at Bethpage Ballpark. Brownell achieved the record with his strikeout of Road Warriors designated hitter Daniel Aldrich to begin the top of the third inning. The swing-and-miss was the 738th strikeout of his Atlantic League career, allowing the righty to surpass Tim Cain for sole possession of first place on the all-time strikeouts list. Cain had held the record since the 2007 season, the last of his 10 seasons in the Atlantic League, which he spent with the Newark Bears (1998-2001), Bridgeport Bluefish (2002-05), Long Island Ducks (2006-07) and Camden Riversharks (2007). The 35-year-old Brownell is currently in his seventh season with the Ducks. He first joined Long Island late during the 2012 season and immediately helped lead the Flock to consecutive Atlantic League championships. He was named the Championship Series MVP in 2013 after winning all three of his starts in the series against the Somerset Patriots. He later garnered Atlantic League’s Pitcher of the Year honors in 2015 after leading the league in wins (12), innings pitched (175.2), complete games (4), shutouts (2) and strikeouts (146). Brownell earned his first Atlantic League All-Star Game selection in 2017 and then served as a coach for the Liberty Division at the 2018 All-Star Game on Long Island. A former Philadelphia Phillies draft pick, Brownell currently ranks third all-time in the Atlantic League for wins (64) and innings pitched (978.1). He trails only Cain (74 W, 1,150.2 IP) and Corey Thurman (66 W, 980.1) in both categories. The Omaha resident currently holds the Ducks all-time records in wins, innings pitched, strikeouts and games started (150). Additionally, he has set the franchise’s single-season records for strikeouts (147, 2016), innings pitched (202.0, 2014), complete games (7, 2013) and games started (29, 2014).